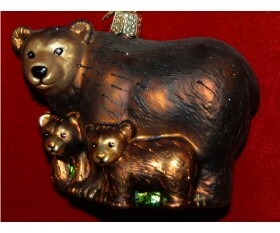 Mama bear and her little ones are sculpted with rich detail and given a warm, attractive coat in this handcrafted, blown glass ornament. The bear with cubs glass personalized Christmas ornament appeals to those who live in bear country or have spotted them on trips to parks and preserves. Russell Rhodes has many other animal ornaments personalized for your pleasure, so it's easy to put together a woodland theme with this mama bear and cubs Christmas ornament and those featuring whitetail deer, red fox, howling wolf and a cute squirrel. Put the "wow" in someone's growl this season with this beautiful piece that arrives in our exclusive black velvet pouch.